Food like everything has trends; they come and go. I love every part of food; from reading recipes and grocery shopping to cooking, and best of all eating! In the last ten years some fads turned into bona fide trends. Moving from $.50 diner coffee to a $5.00 venti nonfat Caramel Macchiato’s and the rise of organic and sustainable foods. More recently we have seen an increase in whole grain and gluten free products. The advent of the “Food Truck” is one of my favorite trends. To be able to get a gourmet Cabrito Butter Burger with Roasted Tomatoes, Charred Onions and Sweet Pickles from the Andrew Zimmern’s food truck is an incredible treat on Nicollet Mall in downtown Minneapolis. We have learned to love quinoa, kale, gluten free and Sriracha (or have we!). One of my favorite new trends in the food industry is the use of fresh herbs. Today’s cooks use them regularly to add flavor and freshness to any dish. Although classic herb gardens have thyme, basil, mint and chives my favorite is Cilantro. Cilantro is easy to grow and can be used in a variety dishes. One key to successful cilantro is to prune the flowers when it begins to grow. If you don’t, the stems become woody and the flavor changes. The Dakota Jazz Club in Minneapolis uses it in their chorizo stuffed peppadew pepper and the Barriro Tequila Bar on Hennepin uses a cilantro-lime vinaigrette in their mixed green salad and also in their barbecued pork torta. One of my personal favorites is Southwestern Spiced Sweet potato fries with chili-cilantro sour cream. Another is Cilantro sugar which can be used to dip watermelon or rim cocktail glasses. 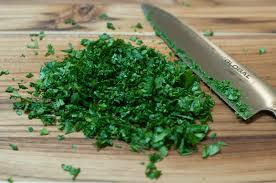 One other noteworthy item: Each 100-g serving of raw cilantro leaves provides over 521 mg. of potassium. Cilantro adds a unique and subtle flavor to many dishes. One thing I know for sure is that overall the trends have been focused on delicious, healthy, and flavorful foods. Herbs play a key role in enhancing both savory and sweet dishes. I am a true foodie at heart. My education and early experience was in food science/R&D and now as a CPG recruiter I just can’t get enough of what the food industry has to offer. I look forward to seeing what the next ten years bring.